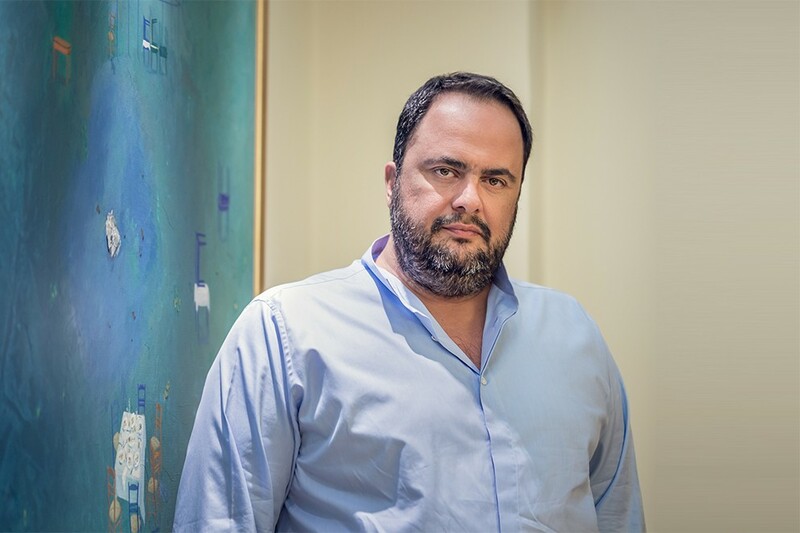 Evangelos Marinakis is an international businessman and investor. He first made his name in the shipping industry, but has since then also invested in media and football in Greece and the UK. Besides his business and sporting interests, Evangelos also actively supports a number of charitable causes both in Greece and around the world. Evangelos is Founder and Chairman of Capital Maritime Trading Corp. He is one of the leading shipowners in the maritime industry. Capital Maritime and its affiliated companies operate a total fleet of 78 ships and overall tonnage of approximately 9.3 million tonnes (dwt), having consistently invested in the tanker, container, LNG and dry bulk segments over the years. In 2017, shipping industry British publication 'Lloyd's List' voted Evangelos its "Greek Shipping Personality of the Year", while he has been ranked among the top 100 most influential people in the maritime industry by various publications such as Lloyds List, TradeWinds, annually since 2010. For 9 consecutive years, he was included in the Lloyd's List "One Hundred Most Influential People in the Shipping Industry" list, ranking 59th in 2018, 66th in 2017, 61st in 2016, 65th in 2015, 67th in 2014, 73rd in 2013, 84th in 2012, 84th in 2011, 88th in 2010. Since the summer of 2010, Evangelos is a leader and majority shareholder of the most successful and most popular football club in Greece, Olympiacos FC. Under his ownership, Olympiacos has won seven consecutive championships 2010/2011, 2011/12, 2012/13, 2013/14, 2014/15, 2015/16 and 2016/17 and the highest ranking position (21st) in Europe, in Olympiacos’ history of all times. In 2017, he broadened his sporting horizons further when he became the majority owner of the most historic English football club, Nottingham Forest FC. Evangelos was born in 1967 in the Greek port city of Piraeus. He is the son of Miltiadis Marinakis, a shipowner and politician from Crete. His mother is Irene, whose family hail from the Pontus region and descend from the prominent Ypsilantis family. Throughout his life, he has been a strong supporter of actions to commemorate the victims of the genocide of the Greeks of Pontus, a lesser known tragedy in which around 350,000 Greeks perished. Ιn 2014, his passion for his home city of Piraeus led him to get involved in local civic life. Together with the current Mayor of Piraeus, Yiannis Moralis, they founded the independent electoral alliance called "Piraeus Winner", which contested and won the municipal elections of that year. Evangelos was voted, with more than 14,000 votes - a record vote in the history of local council elections - first member of the City Council. Evangelos attended a public school in Piraeus, Greece and in Watford, England. He then studied for a BA in 'International Business Administration' and completed his studies with a Master's Degree in 'International Relations'. He is married to Athanasia Kassioti and they have four children.